This article is about the number. For the year, see AD 5. For other uses, see 5 (disambiguation), Number Five (disambiguation), and The Five (disambiguation). Five is the third prime number. Because it can be written as 221 + 1, five is classified as a Fermat prime; therefore a regular polygon with 5 sides (a regular pentagon) is constructible with compass and unmarked straightedge. Five is the third Sophie Germain prime, the first safe prime, the third Catalan number, and the third Mersenne prime exponent. Five is the first Wilson prime and the third factorial prime, also an alternating factorial. Five is the first good prime. It is an Eisenstein prime with no imaginary part and real part of the form 3n − 1. It is also the only number that is part of more than one pair of twin primes. Five is a congruent number. The number 5 is the fifth Fibonacci number, being 2 plus 3. It is the only Fibonacci number that is equal to its position. 5 is also a Pell number and a Markov number, appearing in solutions to the Markov Diophantine equation: (1, 2, 5), (1, 5, 13), (2, 5, 29), (5, 13, 194), (5, 29, 433), ... (OEIS: A030452 lists Markov numbers that appear in solutions where one of the other two terms is 5). Whereas 5 is unique in the Fibonacci sequence, in the Perrin sequence 5 is both the fifth and sixth Perrin numbers. Five is the second Sierpinski number of the first kind, and can be written as S2 = (22) + 1. There are five Platonic solids. Five is the only prime number to end in the digit 5 because all other numbers written with a 5 in the ones place under the decimal system are multiples of five. As a consequence of this, 5 is in base 10 a 1-automorphic number. In the powers of 5, every power ends with the number five and from 53, if the exponent is odd, then the hundreds digit is 1; instead, if it is even, the hundreds digit is 6. The evolution of the modern Western glyph for the numeral 5 cannot be traced back to the Indian system as for the numbers 1 to 4. The Kushana and Gupta empires in what is now India had among themselves several different glyphs which bear no resemblance to the modern glyph. The Nagari and Punjabi took these glyphs and all came up with glyphs that are similar to a lowercase "h" rotated 180°. The Ghubar Arabs transformed the glyph in several different ways, producing glyphs that were more similar to the numbers 4 or 3 than to the number 5. It was from those characters that Europeans finally came up with the modern 5. The god Shiva has five faces and his Mantra is also called Panchakshari (Five Worded) mantra. The goddess Saraswati, goddess of knowledge and intellectual is associated with Panchami or number 5. There are five elements in this universe: Dharti, Agni, Jal, Vayu evam Akash (Earth, Fire, Water, Air and Space respectively). The most sacred tree in Hinduism has 5 leaves in every leaf stunt. Most of the flowers have 5 petals in them. The epic Mahabharata revolves around the battle between Duryodhana and his 99 other brothers and the 5 pandava princes -Dharma, Arjuna, Bhima, Nakula and Sahadeva. Each page of the Principia Discordia—the primary religious document in Discordianism—is labeled with five digits. According to Shia Muslims, the Panjetan or the Five Holy Purified Ones are the members of Muhammad's family: Muhammad, Ali, Fatimah, Hasan, and Husayn and is often symbolically represented by an image of the Khamsa. The Torah contains five books—Genesis, Exodus, Leviticus, Numbers, and Deuteronomy—which are collectively called the Five Books of Moses, the Pentateuch (Greek for "five containers", referring to the scroll cases in which the books were kept), or Humash (חומש, Hebrew for "fifth"). The five sacred Sikh symbols prescribed by Guru Gobind Singh are commonly known as panj kakars or the "Five Ks" because they start with letter K representing kakka (ਕ) in the Punjabi language's Gurmukhi script. They are: kesh (unshorn hair), kangha (the comb), kara (the steel bracelet), kachhehra (the soldiers shorts), and kirpan (the sword) (in Gurmukhi: ਕੇਸ, ਕੰਘਾ, ਕੜਾ, ਕਛਹਰਾ, ਕਿਰਪਾਨ). Also, there are five deadly evils: kam (lust), krodh (anger), moh (attachment), lobh (greed), and ankhar (ego). Myst (series), uses the number 5 as a unique base counting system. In The Myst Reader series, it is further explained that the number 5 is considered a holy number in the fictional D'ni society. Fifth Harmony, an American girl group. The TV show and comic called The Umbrella Academy has a main character named "Number Five"
5 (TV channel) (formerly known as ABC 5 and TV5) (DWET-TV channel 5 In Metro Manila) a television network in the Philippines. Tillbaka till Vintergatan, a Swedish children's television series featuring a character named "Femman" (meaning five), only can utter the word 'five'. The Five (talk show): Fox News Channel roundtable current events television show, premiered 2011. So named for its panel of five commentators. Yes! PreCure 5 is a 2007 anime series which follows the adventures of Nozomi and her friends. It is also followed by the 2008 sequel Yes! Pretty Cure 5 GoGo! Hawaii Five~0, CBS American TV series. Each team has five players on the court at a given time. 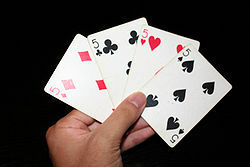 Thus, the phrase "five on five" is commonly used to describe standard competitive basketball. Under the FIBA (used for all international play, and most non-US leagues) and NCAA women's rule sets, a team begins shooting bonus free throws once its opponent has committed five personal fouls in a quarter. A major penalty lasts five minutes. There are five different ways that a player can score a goal (teams at even strength, team on the power play, team playing shorthanded, penalty shot, and empty net). The area between the goaltender's legs is known as the five-hole. In most rugby league competitions, the starting left wing wears this number. An exception is the Super League, which uses static squad numbering. A try is worth 5 points. One of the two starting lock forwards wears number 5, and usually jumps at number 4 in the line-out. In the French variation of the bonus points system, a bonus point in the league standings is awarded to a team that loses by 5 or fewer points. A pentamer is an oligomer composed of five subunits. In the computer game Riven, 5 is considered a holy number, and is a recurring theme throughout the game, appearing in hundreds of places, from the number of islands in the game to the number of bolts on pieces of machinery. The Garden of Cyrus (1658) by Sir Thomas Browne is a Pythagorean discourse based upon the number 5. 555 95472, usually referred to simply as 5, is a minor male character in the comic strip Peanuts. ^ Sloane, N. J. A. (ed.). "Sequence A028388 (Good primes)". The On-Line Encyclopedia of Integer Sequences. OEIS Foundation. Retrieved 2016-06-01. ^ Sloane, N. J. A. (ed.). "Sequence A003273 (Congruent numbers)". The On-Line Encyclopedia of Integer Sequences. OEIS Foundation. Retrieved 2016-06-01. ^ Kisia, S. M. (2010), Vertebrates: Structures and Functions, Biological Systems in Vertebrates, CRC Press, p. 106, ISBN 978-1-4398-4052-8, The typical limb of tetrapods is the pentadactyl limb (Gr. penta, five) that has five toes. Tetrapods evolved from an ancestor that had limbs with five toes. ... Even though the number of digits in different vertebrates may vary from five, vertebrates develop from an embryonic five-digit stage.